Need something decorative to hide all those K-Cups for your Keurig????? We've got you covered! 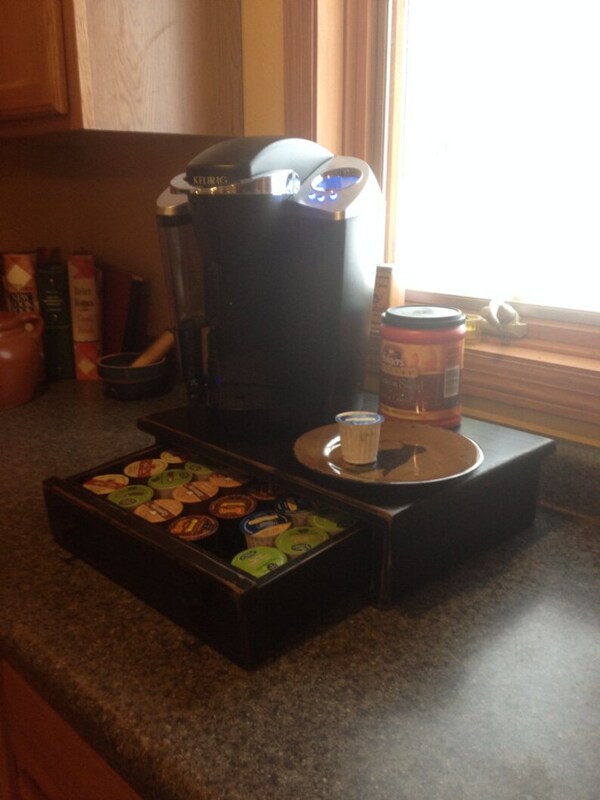 This Primitive K-Cup Drawer would look perfect sitting on your counter top and this large version will hold 24 K-Cups!! (6 rows of 4) which gives still you plenty of space to sit the Coffee Pot, creamer and whatever else on top!! It measures roughly 16 1/2" wide by 11 3/4" by 4 1/2" high. This one is in Black and is distressed, stained in dark walnut and is sealed with a satin finish clear coat. The drawer features two black hammered knobs. As always, other colors are available by custom request. Please note that all my items are "Made to order" at the time of order. Please allow 3-4 weeks for delivery. Thanks for shopping with Crow Corner Primitives and Happy Etsy-ing!! Item was primitive perfection! I loved it & I would definitely purchase from this shop again. Primitive Family Name Sign with Wedding Date and Rusty Star.